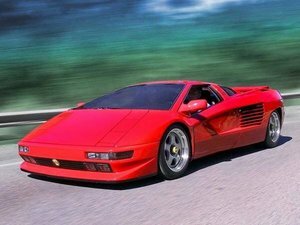 Cizeta Automobili srl of Modena, Italy was a car manufacturer set up in the late 1980s by Claudio Zampolli (an Italian Ferrari dealer) and the record producer Giorgio Moroder. The name "Cizeta" comes from the Italian pronunciation of co-founder Claudio Zampolli's initials (C.Z.). Moroder became involved into the project when he took his Lamborghini Countach for a service at Zampolli's garage. 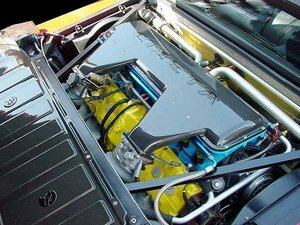 Their only product, the Cizeta-Moroder V16T, featured a technically advanced sixteen cylinder engine made up of two coupled V8s sharing a single block and styling by Marcello Gandini that was strikingly similar to the later Lamborghini Diablo's as Gandini first proposed the design to then Chrysler-owned Lamborghini which altered the concept significantly. Gandini then brought the original Diablo design to Cizeta. The prototype was the only car to carry the "Cizeta-Moroder" badge, as Giorgio Moroder pulled out of the Cizeta project in 1990. The prototype remains with Giorgio Moroder to this day. No production Cizeta was ever badged "Cizeta-Moroder" but merely "Cizeta V16T". Only 8 cars were built before the shutdown of the firm in 1994. Subsequently, 2 more cars were completed (one more coupe, and one spyder) in 1999 and 2003. Mr. Zampolli moved to the USA after the company went bankrupt in Italy and has set up a new company in California, called Cizeta Automobili USA. He currently services exotic cars as well as continues to build (on demand) the Cizeta V16T. The brand faded into virtual obscurity until its inclusion in the video game Gran Turismo 4. Ian Kuah takes us back to the peak of the supercar boom when he visited a small factory in Modena. It was there that he interviewed an optimistic constructor, Claudio Zampolli, who had no idea that the financial world was about to go bang - and take his project with it. In fact, the car was not a working entity at that time. The press launch in December 1988 presented the mock-up and many design sketches. The first production car was black and was shown at Geneva in 1991 before going to its owner in Singapore. Full production began some six months later. I did not go to Los Angeles in 1988, but in the summer of 1992, Cizeta was high on my hit list when I undertook a pilgrimage to Modena, Mecca of the Italian supercar. I had been at Maserati the day before and cizeta was just a few streets away off the same main road. In stark contrast to the Maserati factory, Cizeta's unassuming looking building was midway down a street that combined low rise office building with factory units. It was hard to imagine that futuristic looking supercars emerged from this building every so often. I was met by Claudio Zampolli, Mr. Cizeta (pronounced Chey-Zeta, the way the initials CZ, Zampolli's initials, are spoken in Italian) himself. Totally laid back in the typical Italian way, Zampolli sat me down in his office and recounted his story in fluent English, with a Transatlantic twang. No surprise really, as one of the first things he revealed was that he and his family had lived in Los Angeles for many years. "Before that, I was a test and development engineer at Lamborghini, where I worked on the Miura and Countach," he explained. "But I was looking for an opportunity to run my own show, and decided to go to America." A dyed-in-the wool petrolhead, Zampolli put his intimate knowledge of Italian supercars to good use. Setting up an exotic car dealership on Wilshire Boulevard in west Los Angeles, he sold and serviced Ferraris, Lamborghinis, and other Italian supercars. "This was quite and education in the real world," he explained. "At Lamborghini, my job had been to develop and test. Here, I had to listen to customers complain about reliability, and mechanics complain about how difficult the cars were to work on." So when the first thought about building his own car started to percolate in the closing months of the 1970's, these practical lessons were very much part of the design process. A Well Kept Secret To avert this, Zampolli kept thing secret to avoid such negative comments. "I didn't want to be knocked down before building it," he said. "The only people who knew about the car were the craftsmen working on the prototype. It was such a big secret that even my family, who had to put up with my frequent trips to Italy, were not privy to the project! When the mock-up was ready, I suddenly said that I was launching a 16-cylinder sportscar. Even the Italian press did not know!" So why 16-cylinders? If the car had 12-cylinders, it would be no big news. "As a small and exclusive car maker, I had to be different," Zampolli explained. "16 cylinders is very exotic, and the engine is strong and torquey. It is also very docile. You can drive around town in fourth gear. It is like driving an auto." A visible show of pride and allegiance to Italy and Modena is shown in the Cizeta company logo. For this, Zampolli adopted the city of Modena's colours, blue and yellow. The wolf's head logo is symbolic of the Tiberian she-wolf which fed Romulus and Remus, the orphaned children of Mars who founded Rome. To this, he added his own initials, CZ. The raised parts of the cam covers and the long intake plenum are also picked out in blue and yellow. Class Craftsmen The tooling was made in-house along with the jigs. All the engine work was done by local workshops in Modena. "There are lots of small workshops around here that will make you half a dozen of something rather than 1,000," Zampolli explained. "These are people well versed with F1 or just exotic sports cars. Most of the craftsmen in my company have at least 30 years experience with specialist cars, and many I knew from Lamborghini." Chief engineer and head of engine development was Oliviero Pedrazzi; Archille Benveni and Lanose Bronzatti were the chassis men and the master fabricator was Giancalo Guerra. All were recruited from Lamborghini. "All the work is done here except machining. We assemble the chassis, suspension, sheet metal, engine components and upholstery," Zampolli explained. "Machining is contracted to a precision workshop which makes components for F1 engines. Buying such machines is a big investment which I don't want to get involved in. If I started the whole project again with big money to invest in machinery I still wouldn't, because I know I can get excellent work from all these local workshops without incurring the capital outlay." The unique cylinder block was made on special Swiss tooling, and is a single aluminum alloy casting with twin steel crankshafts running through its centre. These cranks are made by the French race and prototype engine company Mobilor, and have huge gears that feed power to the longitudinally mounted ZF gearbox. It is this configuration that gives the car its V16 T designation. A pair of pumps send and return the cooling fluid, and there are two big radiators as well. The engine is mounted transversely in the chassis a la Miura, and is also inclined 10 degrees forward to help keep the center of gravity low and help it mate to the trans-axle. The internal architecture of the engine is similar to the motor in the Lamborghini Urraco P300s. In fact, even the bore and stroke of 86.0 x 64.5mm are the same as this classic small block V8. The concept of the Cizeta motor shunts two such engines together nose-to-nose with the two timing chains in the center. The thick liners in each bore suggest that capacity could easily be increased from the given 5,995cc. Having run his exotic Italian supercar workshop in Los Angeles in a very hands-on manner, Zampolli was well aware of the servicing problems designed into such cars. This is something he actively sought to avoid with the Cizeta, hence the huge clam-shell engine cover that swings clear enough to make access as easy, if not easier as on the average family saloon. The engine itself was designed to eliminate a big proportion of the fussy maintenance requirements of normal Italian super-cars. The Cizeta's purposeful look is enhanced by the no-nonsense five-spoke, two-piece OZ Racing alloy wheels which are secured by a single centre locking nut. These are 9J and 13J x 17-inch and shod with 245/40ZR17 and 335/35ZR17 Pirelli P-Zeros. Between their sturdy spokes you can see the beefy four-pot calipers embracing 12-inch Brembo vented and slotted discs. At a glance, the Cizeta bears a huge resemblance to Lamborghini's Diablo. 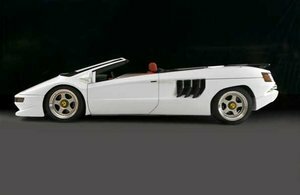 Not surprising when you learn that Zampolli also used Marcello Gandini, who penned the Diablo around the same time. The first design, which was resting in a corner of the workshop, was taken all the way to a full scale model. Unfortunately, it was rather too conservative, to the point of blandness. Zampolli gently told Gandini this by way of suggesting a few minor changes here and there. At this point, Gandini himself confessed to not liking it much either, and set to work on a fresh proposal which became the production model. The shape of the body was very much dictated by the layout of the car's underpinnings, and the huge transversely located power unit set the very wide 81 inch track. The rest of the car grew from there. "If you compare us with Bugatti, the concepts are diametrically different," Zampolli explained. "I am building a simple concept, they are doing it the most dificult way. Cars like the Porsche 959 are really over-complex. Sporty, elegant, simple are our watchwords. If you want a luxury car, you buy a Mercedes. It is as simple as that. People who do that look for little noises, etc. Other supercars have electric everything. We do a good air-con but keep gadgets out." Minimalism is certainly evident in the plush leather trimmed cabin. Where there is normally a plethora of gadgets and instruments in such cars, here there is only a big tachometer and speedometer to look at. Other functions like water temperature and oil pressure are taken care of by idiotlights. "People don't look at gauges," Zampolli says. "So I decided to make things compact and simple with everything in front of you like a racing car. I love old Ferraris and they are like this." "In interviews I gave in the late 1980's, I always said I would stay small," explained Zampolli. "The product we are building here is so exclusive that even at 50 cars a year I would have to hire a lot more people. It is hard to find skilled people at this level of quality." At the time of my visit in May 1993, Cizeta had delivered five cars and had six more underway. "The maximum is 12 cars a year at this point, but if the market really picks up, I could expand to as many as 225 a year," Zampolli said. "Some people do a definite number, but I will build them as long as people want them. Cars like the Boxer and Countach were in production for around 10 years. We will make changes and improvements but have a car that will stay around for a long time." Speed tests in early 1993 at Nardo were planned. European homologation would follow. Early cars were delivered to Far Eastern countries. In fact, Cizeta's Japanese importer, whom I met during my visit, was Mr. Nobuo Harada, owner of the famous Harada Collection of classic and famous sportscars. Sadly, it was not to be. Not too many months after, with Japan still lingering from deep recession and the rest of the world not too keen on big money supercars, Cizeta's order book dried up. We are not quite sure when exactly the company stopped trading, but unlike Bugatti, its demise did not make big headlines. Cizeta went out with a whimper not a bang.